This article develops a non-linear model of the ordo salutis with Christ at the centre. It shows that each individual event is a manifestation of what Christ has done and a call to faith in him. Faith is shown to comprise of consensus (agreement) and fiducia (trust). Through this model, the creative tension between the objective (indicative) and the subjective (imperative) dimensions of the gospel as well as the tension between God's eschatological time and our unfulfilled time are maintained in such a way that they both complement and limit each other. This tension, it is argued, is intrinsically linked to the way in which Christ continues to be present within our world as both Lord and Spirit. As Lord, Jesus is proclaimed as the One who has already overcome our broken reality; as the Spirit, Christ continues to be vulnerable to be resisted and rejected by us. As the Spirit of the risen Lord, he is nevertheless able to perform miracles and overcome our broken reality as the gospel is proclaimed. A short analysis of the way in which the Bible refers to some of the events in the ordo salutis confirms the legitimacy of this model. INTRADISCIPLINARY AND/OR INTERDISCIPLINARY IMPLICATIONS: It is argued that this model overcomes many objections against the traditional understanding of the ordo salutis. By challenging the underlying presuppositions of both Arminiaism and Calvinism, this article provides a unique alternative which does justice to key insights from both traditions and adds a new voice to the ongoing debate between Arian, Pelagian and semi-pelagian theologians, on the one side, and Reformed theologians, on the other side. It thus makes a significant intradisciplinary contribution to systematic theology. It also aligns the universality of salvation in Christ as the second Adam to the continuing need for a personal faith response to Christ. The doctrine of the ordo salutis has successfully transcended its original, narrow, Reformed context and today operates as a key theological framework by which a wide spectrum of believers understand their Christian identity and communicate their faith to non-believers.4 Within charismatic, pietistic and evangelical theologies, terms such as born again, repentance and sanctification play significant roles that shape their adherents' theology. Reflecting on the ordo salutis remains critically important. In Australia, for instance, the term 'born again Christian' rates a -5 amongst unbelievers whilst practising Christian rates it a +28.5 The significance and relevance of this article thus extends beyond a reflection on an isolated and somewhat esoteric Reformed theological doctrine. The ordo salutis directly impacts on the way in which a large segment of Christians appropriate the message of salvation and communicate it to the world. Theology practised within the domain of the academy can easily isolate itself from the theology of the pew. This, however, happens at its own peril. It is the theology of the pew which drives the church and creates the framework within which people experience their faith. It is remarkable that the doctrine of the ordo salutis, which can be characterised as technical and obscure, continues to play such a large foundational role in popular theology. This article seeks to offer a way for the academy to engage in serious dialogue with the popular theological understanding of salvation as promulgated in the ordo salutis. In this article, I plead for a new understanding of the ordo salutis which places Christ at the centre of salvation and maintains his centrality within each specific event of the ordo salutis. Each event, it will be argued, is a manifestation of what Christ has done to procure salvation, and it is also a call to faith in him. Faith is shown to comprise both consensus (agreement) andfiducia (trust). Through this model, the creative tension between the objective (indicative) and the subjective (imperative) dimensions of the gospel as well as the tension between God's eschatological time and our unfulfilled time are both maintained in such a way that they complement and limit each other. It will be shown that this tension flows from the way in which Christ continues to be present within our world as both Lord and Spirit. As Lord, Jesus is proclaimed as the One who has already overcome our broken reality. As the Spirit, Christ continues to be vulnerable to be resisted and rejected by the world. As the Spirit of the risen Lord, the Spirit is nevertheless able to perform miracles and overcome our broken reality through the church's proclamation of the gospel message in words and deeds. This model provides a Trinitarian rather than anthropological, psychological or pneumatic-mystical approach to understanding the realisation of salvation within the world. The model still calls for an existential and experiential appropriation of the gospel, but it firmly anchors this appropriation to the Christological indicatives contained in the gospel message. Without such anchoring, the uniquely Christian element of the Christian faith-experience may end up being replaced by an amorphous general religious experience.6 In an interview on the religious programme Compass, for instance, Australian Quakers indicated that many people in the movement do not necessarily see themselves as distinctively Christian any more.7 I wish to argue that Christ needs to be the ground, means, focus, goal as well as the critique of our religious experiences for those experiences to continue to qualify as Christian experiences. 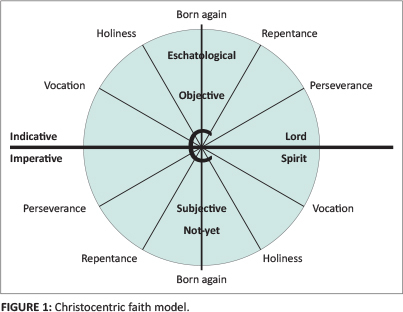 This model will enable the church to epistemologically ground her religious experiences as faith-experiences whilst Christ, the object of faith, remains beyond the subjectivity which marks our experiences. The issues that this article addresses are thus not abstract but grounded on the praxis of how many believers understand, appropriate and communicate their salvation. The task of theology is to critically engage with such operational theology in the light of Scripture. The development of a theological doctrine on how Christian salvation may be appropriated in the praxis may seem innocuous enough, but a range of theological objections have been raised against it. The first of these is that the ordo salutis primarily reflects how an individual may come to salvation. Venema (2007:199) sees the ordo salutis as deviating from Calvin's emphasis upon the theological and Christological basis for understanding the nature of God's grace in us by limiting the work of the Spirit in salvation to what happens to and in the individual believer.8 In this process, anthropology rather than Christology or theology becomes the main focus within soteriology. Salvation is here not seen as something separate from Christ but is, instead, linked directly to his person and the inter-personal relationship of the sinner with him. Gaffin (in McGowan 2007:284) points to Calvin's presentation of the ordo salutis and then specifically the way in which he treats sanctification by faith before justification by faith. This can only happen, he contends, because Calvin links both doctrines intrinsically to the person of Jesus Christ. According to him, union with Christ by faith is the essence of Paul's ordo salutis. In his Institutes, Calvin (1816:3.11.6) depicts the interrelationship between sanctification and justification in terms of a metaphor in which Christ is the sun, justification its light and sanctification its heat. The sun is the source of both, and the both of them are thus always present where the sun is present. They remain different from each other - the light illumines and the heat warms, but they are both ways in which their source (the sun) presents itself. It is, however, also true that some other pronouncements of Calvin were foundational for the later development of the ordo salutis within Reformed Orthodoxy. Union with God in Christ through the Holy Spirit must be, and remains at the heart of soteriology.9 It is important to maintain the Trinitarian basis of the ordo salutis in this context. The danger of tri-theism in which the work of the Father and the Son are divorced from each other is ever present. This is because the work of salvation cannot be separated from the person of God as an opus extra deum [a work outside of or separate from, God], but it is intrinsically linked to the person of God.10 'God is salvation: it is not simply an action He performs; the action is an act in which one can understand His being' (Greggs 2009:3). In many Reformed systems, the ordo salutis is treated as part of pneumatology. However, when the work of the Spirit in salvation is separated from the work of Christ, the Spirit's work may be seen as complimentary or even supplementary to the completed work of Christ for our salvation. The question is then whether Christ has in fact realised salvation or does he merely provide the possibility for salvation? Our time and God's eternal time are thus enmeshed with each other because God is present in both. Not only is God's time in our time, but our time is also taken up in God's time. The grounding for the presence of the Holy Spirit in our time remains Christological.14 In Christ, God has entered our time in such a way that what happened to Christ would have eternal consequences for God. The crucified Lord is designated as the eternally crucified Lamb on the basis of the unique once and for all event of his crucifixion within our time. At the cross, our 'lost time' has thus been salvaged and redeemed to become and be eternal time. Our history is not simply the bearer of revelation. Whilst it is not revelation in and of itself, it is taken up into revelation. It becomes part of God's history, and God's time for us becomes history in our history. The incarnation and glorification of Jesus are, and remain, pivotal events for both God and ourselves. Any construction of an ordo salutis in which God's time or eternity undoes or relativises 'lost' or human time is to be rejected. A model of the ordo salutis will, therefore, have to do justice to the centrality of the historical event of salvation in Christ as well as to the continuing significance of the events taking place in the time of the 'not yet'. Many different solutions have been offered on how these seemingly diverse descriptions of 'how one is saved' interrelate. Heyns (1978:303) suggests that the ordo salutis is based on logical rather than chronological distinctions, but then, only a few pages on (ibid. 1978:307), he refers to vocation and regeneration as the beginning of the individual's spiritual life and repentance as the result of the progressive work of the Holy Spirit 'in, aan en oor die mens' (ibid. 1978:315).15 The temporal character of the ordo salutis must continue to be recognised as a significant aspect of salvation and needs to be an integral part of any model of the process of salvation in such a way that (1) our temporal participation in salvation does not relativise the 'once and for all' and eternally valid character of the salvation procured by God for humanity in and through Christ and (2) the temporal dimension of salvation within the context of the 'not yet' does not get absorbed into eternity or God's time in such a way that it loses its ongoing significance.16 I believe that a Christocentric model, instead of a linear model of the ordo salutis, will fulfil these requirements more adequately. A Christocentric model of the ordo salutis does not signify a timeless understanding of God's work for our salvation and the appropriation of this salvation. God's fulfilled eschatological time and our broken 'not yet' time are both present simultaneously in the proclamation of the gospel. They only exist in relation to each other and thus always imply each other. The gospel without the demand for immediate appropriation and transformation of this world is not the gospel. In the same way, the demand for appropriation and transformation without the proclamation of the new reality already wrought by Christ is also not the gospel. The individual subjective and existential dimensions implicit in the imperative of the gospel and the transformational presence of the Holy Spirit in the church and with the proclamation of the gospel need to be seen in a creative tension with the corporate, objective and eschatological dimensions of the gospel message that in Christ God has acted outside of us, apart from us, despite us, and also with us to bring salvation to us. The same holds true for the Lordship of Christ which should be seen to be in tension with the presence of Christ in the world through the Holy Spirit. Until the return of Jesus in glory and the final transformation (new birth) of the world, the Lordship of Christ is relativised by the continuation of a world in enmity against God. The Holy Spirit continues the presence of Jesus in the world as the loving, vulnerable One. In and through the Spirit, Christ the crucified continues to suffer for the world by being able to be rejected, resisted and ignored. The Holy Spirit as the Spirit of the risen Lord, however, is also able to overcome this world in love and point people to the Kingdom of God which has already been inaugurated through the work of Christ. The indicative and the imperatives of the gospel, however, need to be brought into such a relationship where justification is not absorbed into sanctification or vice versa. According to this model, all the different events of the ordo salutis are seen as essentially expressing the same reality: the breaking in of the restored and thereby constantly right relationship between God and humanity in and through the person and work of Jesus Christ. The figure 'C' at the centre of the circle thus refers to Christ. Reflecting Berkouwer's thought, the lines drawn between the events and the person of Christ represent faith. The circle is divided into two parts. The top half is designated 'indicative' and refers to the eschatological, once and for all completed, act of salvation in and through Christ that is now joyfully being announced to all of the world through the proclamation of the gospel. The different events of the ordo salutis that are indicated within the sphere of the 'indicative' are thus seen as expressing, in their own unique ways, God's decisive event of salvation for the world in Christ that happened without us and apart from us.18 Each event of the ordo salutis is connected to the person of Christ as an expression of faith that this particular event has been fully realised and fulfilled in and through the Christ event. Faith here takes on the form of assensus: To believe is to agree with and/or accept the salvation which is proclaimed as having already been realised for us in Christ and is now given to us.19 Faith is not grounded in itself and does not refer back to itself - faith is only Christian faith on the basis of the object it refers to, namely Christ, who is outside of faith. Moreover, faith's content, that which it confesses, undermines any attempt to turn faith into something that we do or possess. To agree that there is nothing that we can do to procure salvation but that Christ has done it all for us links faith inseparably to God's free gift of salvation. Faith can only confess the message of the grace of God (sola gratia - grace alone) and itself as an out-flowing of that work of grace. In this model, the indicatives (with faith as assensus -agreement) and imperatives (with faith as fiducia - trust) together constitute the gospel message. This message refers to the new reality in Christ in which we participate by faith and which, in turn, demands the transformation of our still-existing old reality through the presence and work of the Spirit with and within those who believe. The different events of the ordo salutis thus have two dimensions: an objective indicative dimension and a subjective imperative dimension which cannot be separated from each other. A cursory look at the way in which the Bible speaks of these events confirms this view. The use of the term in 1 Peter 1:23 incorporates the same eschatological emphasis. 'Wiedergeburt is kein begrif für dass, wass im Inneren des Menschen for sich geht, sondern ein Ausdrück für den Anteil an der neuen Welt (Matth. 19:28)'23 (Weber 1959:666). John's use thus correlates with the other Biblical usages of the term in that it too refers to the new creation that is linked to the external reality of God and his work outside of us and that we encounter in Christ alone - the one who came 'from above' (Jn 3:13). The term 'born again' refers to the 'new creation' or 'human being' that has come about objectively in Christ through his death and resurrection. As such, it carries the connotation of sola gratia [grace alone]. The new creation is constituted by God apart from us. It also functions as an imperative (Jn 3:1-13) as we can see in the link that Paul makes between being a new human being and baptism. The imperative for believers to persevere in their faith thus only functions against the backdrop of Christ's perseverance on behalf of them. As Berkouwer (1958:203) points out, the Bible refers to perseverance in such a way that it brings consolation because the meaning and the possibility of this doctrine reside exclusively in being preserved'. God's commitment to preserve the faith of his people comes out in verses such as Jn 10:28; 6:39; Rm 8:35, 39; 1 Th 3:13; 5:23; II Th 3:5; Phlp 1:6; Heb 7:25; 1 Pt 1:4; 1 Jn 2:1. It is thus only in the light of the security that God keeps us that the urgent demand for us to 'continue in the faith' operates. We are urged to continue to rest in what God has done for us in Christ, once and for all, and not to depend on any other means of being in the right relationship with God. According to Barth (2004a:15), 'faith means sanctification'. In the Bible, such sanctification implies the execution of a choice - of particular places, times, events or historical sequences. Only where such sanctification occurs is God known. In Christ, God has chosen to act in history once and for all to sanctify humanity and allow them to know him and share in his glory. 'Sanctification (for Barth) is thus a Christological and eschatological event' (Higton & McDowell 2004:84). Sanctification is only available to us by faith in Christ who is and remains extra nos [outside of us]. Whilst the Holy Spirit works in nobis [in us], he works to point us away from ourselves and towards Christ, in whom we have been made holy. Sanctification thus keeps us dependent on Christ alone and, thereby, on grace alone. God's history with Israel and the world, culminating in the giving of himself in Christ, continues to call us to turn away from our own choices and to rest on God's choice for us - thus to Christ and faith in God's grace in him alone. Vocation correlates externally to the proclamation of the salvation of the world that has occurred in Christ within our space and time (Jn 3:16; 4:42; Rm 5:18; 2 Cor 5:19; Col 1:20; 1 Tm 4:10; Tt 2:11; 1 Jn 2:2; 4:14). The internal vocation by which humans may feel themselves addressed by the Holy Spirit can only be separated from the proclamation of this gospel at the cost of it ceasing to be a Christian calling. It is only through the proclamation of the gospel that people can believe (Rm 10:1-15). The urgent existential call of God (2 Cor 5:20) functions within the context of 'God who was making the whole human race his friends through Christ' (2 Cor 5:19). The imperative to believe the gospel stands at the heart of God's calling. The Holy Spirit whom Christ has given to be with the church, empowering it to witness to salvation in him, is only received when and where the gospel is believed (Eph 1:13). The work of the Holy Spirit is never independent from the work of Christ and the proclamation of the transformed reality in which we may participate in and through him. It is thus clear that all the various events of the ordo salutis carry both an indicative and an imperative dimension. At the heart of the ordo salutis is the Christ event which represents the way in which humanity has been placed in the right relationship with God (justification). All the other 'events' are thus not true 'events' in and of themselves but instead function as different aspects or implications of the one final event of justification in Christ. They are to be seen as ways in which the richness and depth of this one event unfolds for us within our world. the various events within the ordo salutis are shown to have both an objective, Christological, supra-personal dimension as well as a subjective personal and individual dithe indicative and imperative dimensions of the gospel are both fully maintained. 1. Calvin develops the ordo salutis (or modus salutis) extensively in Book 3 of his Institutes of Christian Religion under the title De modo percipiendae Christi gratiae et qui inde fructus nobis proveniant, et qui effectus consequantur [The way in which we receive the grace of Christ: What benefits come to us from it and what effects follow]. The doctrine generally deals with events such as calling, sanctification, justification, repentance, being born again and believing as well as how they inter-relate, either logically or temporally, with each other in the process of securing salvation. This article aims at using a theological or more specifically a Christological approach to the procurement of salvation. Wenger (2007:320) however argues: Calvin clearly never set out to establish a formal taxonomy of the logical or temporal order of salvation. Several problems ensue from this. First, the whole notion of describing "Calvin's ordo salutis" and in so doing comparing it with those of later generations is again anachronistic. His lack of explanation on the topic should not be read as being either for or against the possibility of such constructions; rather, it should be made clear that his concerns did not involve establishing an explicit position for debates in which he was not involved and which arose after his time. Thus his silence on the issue should demand the same from his interpreters.' According to Wenger (2007:311), 'Calvin destroys Rome's charge [of antinomianism] by showing that faith, in its Protestant understanding, entails a disposition to holiness without particular reference to justification, a concern for Godliness that is not to be understood only as a consequence of justification. Calvin proceeds as he does, and is free to do so, because for him the relative "ordo" or priority of justification and sanctification is indifferent theologically.' Similarly, John Piper is concerned primarily with maintaining the distinction between sanctification and justification. Yet he unfortunately tends to miss the redemptive-historical horizon and the social context of "righteousness" in Paul's letters' (Bird 2011:300). 2. 'The origins of the term have been traced to two Lutheran scholars, Frank Buddeus and Jakobus Karpov, writing between 1724 and 1739.' (McGowan in McCormack 2006:148). In his Expositions of the Gospel of Mark, chapter 10, Elowsky (2009:171) points to the use of the term by Pseudo-Jerome (7th century) who is the only patristic author to use the term. Here, he talks of the order in which the gospel is proclaimed, however, and not how it is received. The ordo salutis operated as a key theological concept, if not term, amongst the Puritans where it designated a broadly theoretical expression of a practical divinity that grounded the quest for salvation on a set of occurrences, ultimately reaching back to the eternal decree of election and the atoning death of Christ, which God had determined would be experienced in an "inseparable connexion" by each believer. Roughly the stages comprised awareness of sin and the vindictive force of divine law, intensifying sorrow and a sense of self-poverty, followed by effectual calling, faith, justification, adoption, sanctification (distinguished in the sin-abating stage of "mortification" and the "inherent holiness" of vivification) and glorification' (Parnham 2005:3). 3. Berkhof (1996:417) sees the development of the ordo salutis as a distinct fruit of the Reformation. 4. There is currently a growing alliance between evangelicalism and Reformed theology in America as evident in the writings of the popular theologian John Piper and others (Hanson 2006:32). In Australia, the Sydney Diocese combine a fairly rigid Reformed theology with evangelicalism (Jenson 2012), and in South Africa, evangelical, pietistic motifs continue to operate strongly in the Nederduits Gereformeerde Kerk (Coetzee 2013). 5. http://blog.mccrindle.com.au/the-mccrindle-blog/church_attendance_in_australia_infographic. The research indicates that the designations fundamentalist Christian was rated at -31 and evangelical Christian -11 whilst the terms ordinary Christian received a +18 rating and practising Christian a +28 rating. 6. This article may also hold significant implications for the inter-faith religious dialogue in which the church is more and more compelled to engage. 8. He nevertheless believes that Calvin's writings already contain the seed for this later development in the ordo salutis. 9. 'The gift of the Son for us and that of the Spirit to us are the two great streams that derive from this, the ultimate promise that God makes of himself to be our God' (Spence 2006:101). 10. Opera trinitatis ad extra sunt indivisa [the external works of the trinity are inseparable] (translation AvO). 11. For Barth's discussion on time, see CD.1.2 (Barth 2010:45-121). 12. In both the Old and New Testament, this Age stands in contrast to the coming Age. This age is marked by brokenness and sin whilst the coming Age represents the eschatologically transformed reality after God's judgement of the old dispensation. Cullmann's understanding of the Biblical concept of time, though disputed in some areas, still remains seminal (Cullmann 1964). 13. Describing Barth's view on the ordo salutis, McCormack (2006:181) states: 'The work of Christ and the work of the Spirit belongs to a single movement of God towards the creature, a movement that entails both the accomplishment of the work of Christ and the awakening of individuals to this accomplishment.' Whilst Barth is right in resisting a duality in the operation of Christ and the Spirit, one should consider where the work of the Spirit and the work of Christ coalesce in salvation. The work of the Spirit is ontologically linked to Christ but not to sinful humanity outside of and apart from him. Sinful humanity receives the Spirit through faith in Christ. 14. Kärkkäinen (2010:360) stresses the intrinsic link between Jesus and the Spirit, an aspect, he contends, that has not received due attention in theology. Just as the Spirit cannot be understood without Christ, Christ cannot be understood without the Spirit. Christ is made Messiah through the Spirit (Kárkkáinen 2010:360). 15. 'in, on and over human beings' (translation AvO). 16. Perhaps the doctrine that most evidently distinguishes an Arminian theological framework from a Calvinist framework can be found in the ordo salutis - specifically in the question of whether faith precedes or follows regeneration (Warren 2009:551). 17. I did not initially develop this model as a direct response to Berkouwer although it may have played a sub-conscious part in the construction of the model. 18. This semi-sphere is designated as 'eschatological' to reflect the once and for all significance of the Christ event. 20. This part is designated as 'not yet' referring to the time of the eschatological expectation of the return of Christ which is still characterised by sin and brokenness. 21. Wesley's theology is sometimes characterised as a movement from faith as assensus in his earlier period to faith as fiducia in 1738 and faith as fiducia grounded on objective experience in 1740 where 'where objective implies that it is not self-generated' (Ayers 2002:272). 22. This also term corresponds to the term with Christ (see Rm 6:3ff. ; Gl 2:19; Eph 2:6; Col 3:1-4) and functions theologically against the background of Paul's depiction of Christ as the second Adam (Rm 5:12-20; 1 Cor 15:22, 45ff.) which points to the cosmic and universal dimension of the work of Christ. In these texts, Christ and Adam function as 'universal personalities ... construed cosmically and eschatologically' (Oepke in Kittel, Bromiley & Friedrich 1976:II 541-542) who comprehend within themselves all the numbers of the generations of men pertaining to them' (Ridderbos 1997:61). 23. 'Born again is not a concept pertaining to that which takes place within people, but an expression of participation in the new creation' (translation AvO). 24. The Greek term palin would have been used to express 'again'. 25. Christ only. Faith only. Solus Sola in the title plays on the two uses of 'only' before Christ and faith.